You gotta love it!!! How adorable are these blankets. They are my favorites and another "must have". 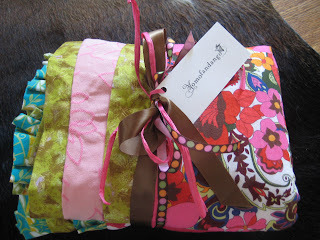 My sister-in-law, Molly, started this little company called momoFandango where she designs baby blankets that are handmade using assorted vintage and modern fabrics. The best part is that no two are alike. The blankets are funky and fresh for all of us hip mothers!! They also make great baby gifts. The heart of the designs come from Molly's love for vintage fabrics and the idea that all things "baby" don't have to be about the usual color schemes (pinks, blues & yellows), soft cheniles, and little bunny rabbits/themes. The blankets are designed so babies can be groovy, hip, sophisticated, and still childlike. Check out the momoFandango website at http://www.momofandango.com/ and the blog at http://www.themomodance.blogspot.com/. Molly hopes to have the blankets up for sell on Etsy and Ebay within the next couple weeks. Once the blankets are posted, I'll let you know. In the meantime, you can contact momofandango@gmail.com for pricing and ordering information.